This is a perfect quick dish. With the addition of my homemade irizake, this simple appetizer tastes so elegantly unique and delicious. 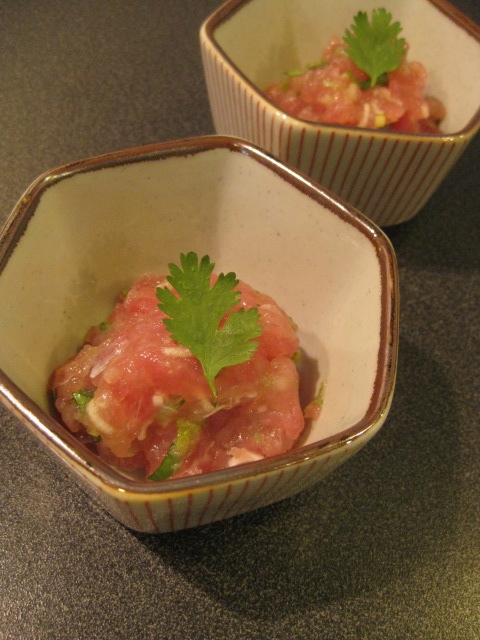 For two, mince 4 oz fresh tuna (for sashimi), and just mix with 1T minced scallion, 1/2tsp wasabi, 1T irizake, 1/4 tsp Maldon salt, and 1 tsp yuzu juice. Divide the mixture into 2 small bowls. I ran out of shiso, so I garnished it with a cilantro leaf:-) Irizake gives such a nice umami taste to the dish.